Insecticides farmers use in Northern California onion seed production appear to repel honeybees, which can result in reduced seed yields, according to a recent study by UC Agriculture and Natural Resources (UC ANR) researchers. Visitation by honeybees is the single most important factor for onion seed set in commercial fields, said Rachael Long, UC ANR Cooperative Extension farm advisor in Yolo County. “The more honeybees that visited the onion flowers, the higher the seed yield,” Long said. If insecticides are applied repeatedly prior to onion bloom, honeybees were less likely to visit once the flowers opened up. Yolo and Colusa county farmers play an important role in worldwide onion seed production. Many different varieties of onions are grown in the region to produce seed ideal for use on onion farms from Siberia to the equator and every latitude in between. George Weiss had been farming in Yolo County for more than 50 years when he noticed a mysterious decline in onion seed production in 2009. He paid a visit to the local UC ANR Cooperative Extension office. “We grow onions for seed, and we weren't getting the seed yields we thought we should have,” said Weiss, 80. He spoke with Long, who immediately began collecting information on insecticide use on the Weiss and neighboring farms. 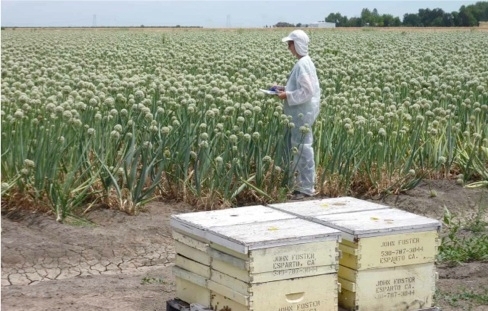 A researcher counts honeybees in a blooming onion field. Onion seed companies and officials at the California Garlic and Onion Research Advisory Board also observed lower yields. “We all noticed a decline in seed production over the years, but we couldn't put a finger on what was happening,” said Bob Ehn, CEO of the California Garlic and Onion Research Advisory Board. Long, Ehn and UC Davis entomology professor Neal Williams worked together to secure a $250,000 grant from the California Department of Food and Agriculture Specialty Crops Block Grant program to solve the onion seed mystery. Ehn's board also provided funding for research. The sharp decline in onion seed yields began when growers were dealing with a new disease, iris yellow spot virus. The virus is spread by tiny insects called onion thrips, so growers began applying insecticides in early spring to keep the pests from moving the damaging disease around the field. Over three years, scientists collected extensive data on insecticide use, honeybee activity, soil moisture, pollen germination, and nectar production on 29 onion seed farms of 25 acres of more. They learned that three applications of insecticide in the spring resulted in less honey bee visitation, which can reduce yield given the importance of honeybees in crop pollination. If farmers sprayed insecticides too close to bloom, there was less pollen germination. Typically, when a bee transfers pollen from the male to female flower, the pollen germinates right away and begins to grow, but less so after insecticide use. “There might be some chemical interaction that prevents pollen from germinating. It's not a huge effect, but there's an impact,” Long said. 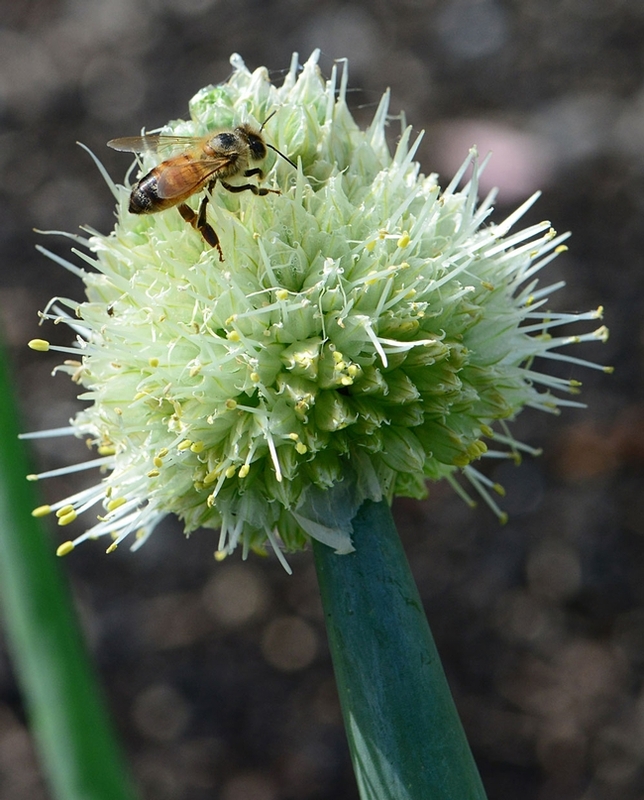 Fungicide use in onion fields did not impact honeybee activity. Pronounced effects of insecticides on pollinator behavior and seed set are more likely at rates of three sprays per year or more, however, even at reduced insecticide use, the researchers still saw the potential for subtle effects on both the pattern of honeybee visitation over time and the pollen-stigma interactions. An onion field in full bloom was the site of UC ANR research. “These results highlight the importance of field management practices on the pollination process. In hybrid onion seed production, we recommend moderation in insecticide use and careful management of water during bloom for maximum nectar production,” Long said. Ehn said the research furnished valuable information for California onion seed growers. Ehn said field research by Long, Williams and other UC ANR Cooperative Extension advisors and specialists is of critical importance to the California Garlic and Onion Research and Advisory Board. Weiss said he highly values the research assistance from UC ANR Cooperative Extension. “I can't pin it down in dollars and cents, but it all goes together with experience,” Weiss said. An initiative to enhance competitive and sustainable food systems is part of UC Agriculture and Natural Resources Strategic Vision 2025.